In rather non-dramatic circumstances, East Bengal has scored one over Mohun Bagan after they signed the arch-rivals’ former captain Katsumi Yusa for the upcoming I-League season. Expected to resigned by the ISL banner Northeast United, Yusa’s surprise signing will break lacs of Bagan supporters from the entire region. Amidst all the speculations centring around the national league and ISL merging, both Bagan and Bengal had held their heads up and before entering the new I-League season, and now covered in the Red ad Gold, Katsumi would be far more than just a boost for the East Bengal brigade going forward. Yusa’s signature were rather luck binding for the East Bengal club and supporters amid plethora of rumours and speculations. 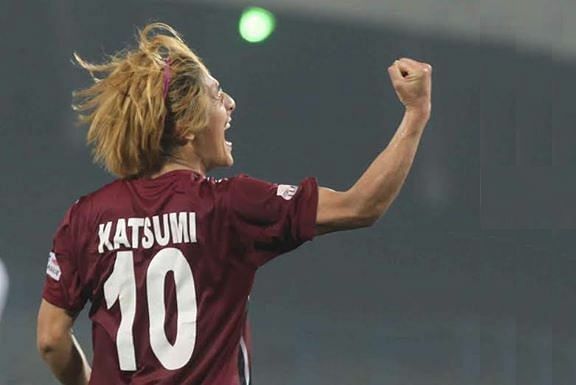 Ever since the Japanese landed on the Indian soil, Katsumi has gained a great deal of acknowledgement—be it the I-League or the ISL outfit. He became one of the most dependable midfielders for both Northeast United and Mohun Bagan as he came almost irreplaceable in the past four years that he spent here. With one I-League and a Federation Cup with Mohun Bagan, the midfielder is known for a refreshing chemistry with the team and particularly his impeccable partnership with the Haitian Sony Norde in search of goals. Staying of Yusa ensures the sigh of relief for the crude Bengali football fans. With the new season just a couple of months away, and with both East Bengal and Mohun Bagan climbing pretty comfortably up the CFL chart, the stakes are high for both the heavyweights. While Mohun Bagan have the pressure to continue the trophy-winning phase, East Bengal are still in desperate quest of winning their first ever I-League.